Please join me at my book launch! What a kick it is to see my book - and photo! - on a display at the library where I used to work. Thank you to my partner in crime, Susan D, and all the wonderful library staff at Kingstowne Library in Alexandria, Virginia. You are the best. You can join me and the Sisters in Crime Donna Andrews and Sherry Harris at the Kingstowne Community Library for a panel discussion and the launch of my first book in the Lobster Shack mystery series CURSES, BOILED AGAIN! 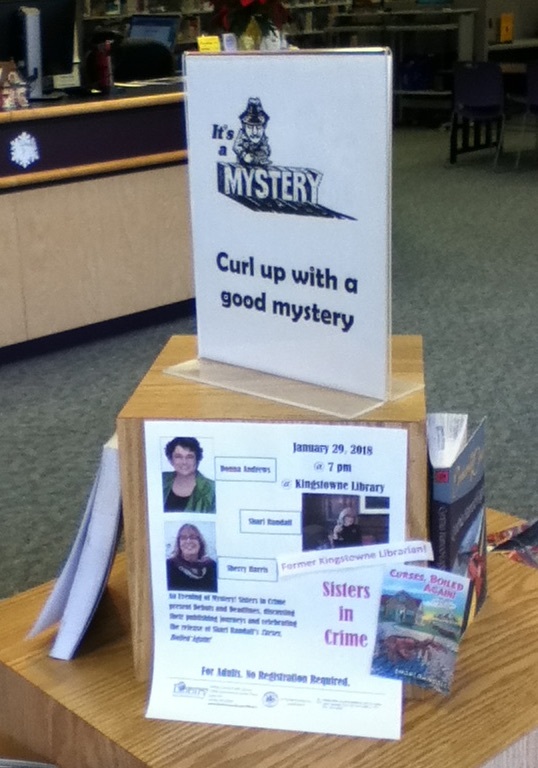 What a kick to see a link to my event on the library's event page! Thank you to my friends at Kingstowne for hosting and supporting my book release. Please come - there will be treats! Excellent article. Cool. Looking towards reading more. Fantastic article. Definitely appreciate it! When I have spare time, I often read your posts. thank you a ton for sharing your knowledge! The writing work is remarkable, and I am so pleased that you were able to share this article here. It's very kind of you to share your writings.They give me effective tips.I really appreciate for this great information,I think this article has a lot of information needed, looking forward to your new posts.